Lanzarote webcams are digital cameras set up around the island and transmitting streaming live video and film of Lanzarote 24 hours a day although some web cams just take a photo (still image) at a set time of the day. The webcams are usually set up near some of the best-known tourist sights and landmarks and accessible over the Internet from your computer or mobile device. 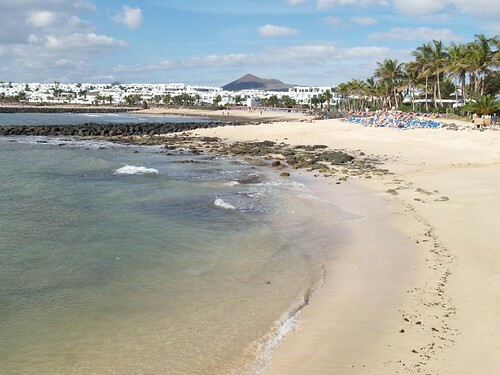 A lot of webcams will be on the beaches of Lanzarote which are great for seeing what the current weather conditions are like – especially useful if you are into sports such as windsurfing or kite-surfing which are very popular on the Canary Island of Lanzarote due to the strong winds. The best beaches for this are Famara and La Santa to the west. You may also want to consider visiting neighbouring Fuerteventura (which you can see from Lanzarote) if you enjoy wind and water sports. The Spanish Canary islands (known also as the Canaries) include Tenerife, Fuerteventura, Gran Canaria, La Palma, La Gomera, El Hierro, La Graciosa, Alegranza, Isla de Lobos, Montaña Clara, Roque del Este and Roque del Oeste as well as Lanzarote which is the fourth largest. Just 140km off the coast of Africa, the climate and beaches makes Lanzarote a very popular tourist destination for people from Northern Europe. Lanzarote enjoys a mild and dry climate – even in the winter month of January it is an average of 21°C in January with August having an average daytime temperature of 29°C. There is just 140mm of rainful annually. This volcanic island has an unusual terrain and a visit to the Timanfaya National Park is one of the best excursions to do if you fancy a break from the beach. Look out for the unique and unusual landmark sculptures from the now dead artist Cesar Manrique. 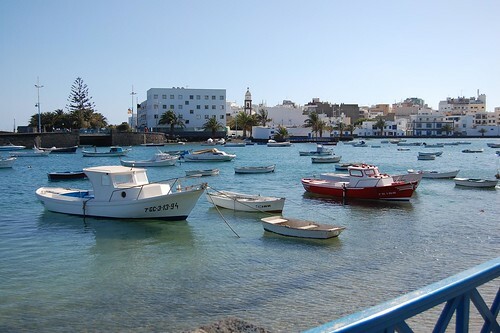 Lanzarote’s most popular resort is Puerto del Carmen, 10 miles west of the airport and capital of Arrecife, with its dark volcanic sands and busy nightlife. 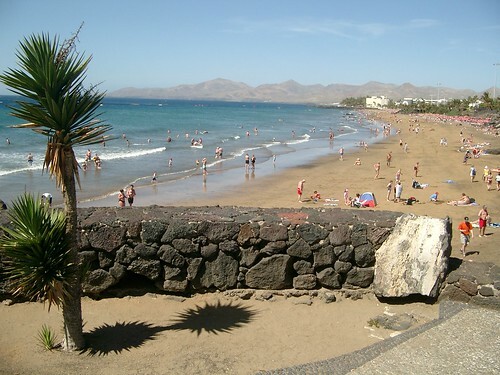 Playa Grande is the main beach at Puerto Del Carmen. Try also the Playa Chica beach which has a lot of water-sports to try such as scuba-diving, jet ski hire, parasailing and snorkelling. For nightlife head to the Avenida de las Playas as well as the pretty Old Town and the lively Strip (including Centro Atlantico). North of Arrecife is Costa Teguise, a modern purpose-built resort with plenty of facilities and things to do for families. Windsurfers love Costa Teguise because of the excellent beaches and consistent winds. This Costa Teguise webcam shows views of the main beach at Playa de Las Cucharas, Costa Teguise, Lanzarote. The capital of Lanzarote and home to the golden sandy beach of El Reducto as well as some of the best fiestas (festivals) on the island. These webcams give you a birds-eye view of the island if you are thinking of taking a holiday or vacation here. Set in the south of the island, Playa Blanca is a fast-growing modern resort with lovely white sandy beaches with the nearby stunning Papagayo beaches often voted amongst the best beaches in Spain. Other popular Lanzarote resorts include Playa de los Pocillos, El Golfo, Matagorda and Playa Honda. Lanzarote is protected with the UNESCO Biosphere Reserve status and there is a lack of high-rise developments thanks to local planning laws. In the 17th century volcanic eruptions created the haunting moon-like landscape of the Timanfaya National Park where you can see the fire mountains (Las Montañas del Fuego). Even in the 19th century there were still volcanic eruptions on Lanzarote. This is the longest volcanic tunnel in the world at over 7 km long and incorporates the La Cueva de los Verdes and Jameos del Agua. Cesar Manrique was a Lanzarote artist who campaigned to keep the island free of high-rise development. His art is visible all over the island in the form of sculptures. Visit the Cesar Manrique Foundation in Taro de Tahiche to find out and see more of his works. He was also responsible for the Cactus Garden with over 10,000 cacti comprising over 1,400 species from all over the world as well as the Canary Islands. Formed over 3,000 years ago the Los Jameos del Agua are incredible lava bubble formations. These can be found next to the Green Caves in the north of the island. Inside the fantastic acoustics are enjoyed in the form of concerts. Lanzarote Webcams – Page Summary – This page contains links to webcams set up on the Spanish Canary Island of Lanzarote. If you are unaware of any other web cams in Lanzarote that we have not listed please do email us.